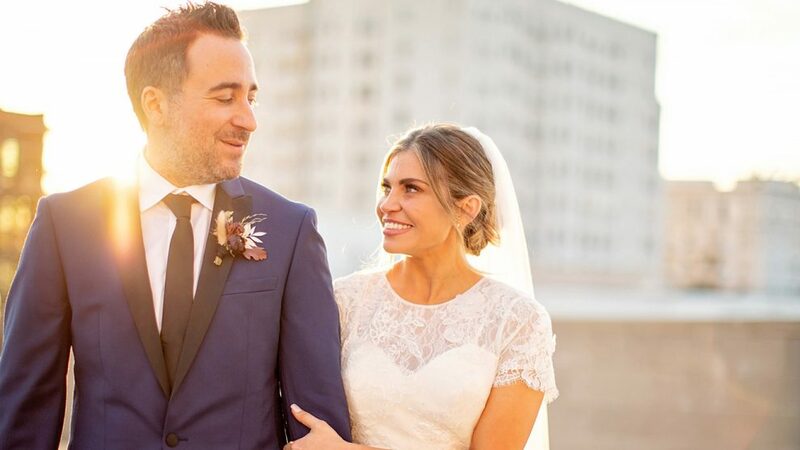 Danielle Fishel and Jensen Karp are married! The “Boy Meets World” star and “Drop the Mic” executive producer said “I do” on Sunday! The wedding, coordinated by Lisa Gaskarth of Union 3 Events, took place at Carondelet House in L.A.
Fishel stunned in a white lace wedding gown with short sleeves and a long veil. She wore her hair pulled back with just single loose curls framing her face. The actress credited Laurie Heaps for her hair and Julie Cuomo for her makeup. Danielle confirmed the news with a photo by wedding photographer Jillian McQuerrey of B.O.B. Photography. This is Danielle’s second marriage. She was married to Tim Belusko from 2013 to 2016.